My Twilight Zone pieces have been so popular I have decided to add a couple more for a limited time. At first glance this looks like a classic picture from the episode "NIGHTMARE AT 20,000 FEET" but look closer. Its actually 100's of mini-pictures that are 1/4 inch by 1/4 inch with remarkable detail (click on "close up" image). 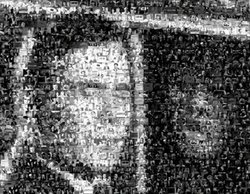 The mini-pictures are of everything Twilight Zone including scenes from all the episodes in the original series, action shots, classic images, Rod Serling and more. The entire item is 8 1/2 inches by 11 inches and perfect for framing. I guarantee this to be high quality and authentic. I am the artist and will sign it personally. The uniqueness of this item cannot be understood truly until you see it in person. Amazingly the farther you move it away the more detail you see. I have created this myself. It will NEVER be mass produced. VERY limited edition!! No more than 25 will EVER be released! You will recieve a numbered COA with this print that has been hand-signed by the artist. 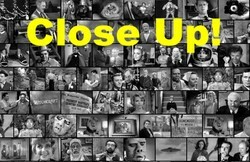 My work has been purchased by the Rod Serling Foundation and has been featured nationally on Coast To Coast AM, TMZ.com, Grand-Illusions.com and has been purchased by museums and professional athletes, it hangs in England, Germany, China, Austrailia and over 20 more countries! I have been commisioned for magazine covers and music albums. Just check my latest feedback to be sure this is a high quality piece of work. And see my other Ebay auctions for GIANT 31 X 24 Wall Art editions too, or I can make a custom one for you and let you purchase it through Ebay! !